In January 1945, just months before Germany's unconditional surrender in World War Two, George S. Patton famously declared the M1 Garand as "the greatest battle implement ever devised." The accolade is well-deserved. This semi-automatic rifle served American troops in the fields of Northern France, the coasts of Okinawa, the dry heat of Africa, and the oppressive humidity of the Philippines. And in more ways than one, the M1 Garand helped win the bloodiest war in human history. Fittingly, the gun that would help to liberate France was created by a French-Canadianâ€”John Cantius Garand. Twenty years after moving to America at age eleven, Garand began working at the Springfield Armory in Massachusetts on a series of semi-automatic rifle designs in 1919. His timing couldn't have been better. After the nightmarish, bloody demonstration of modern warfare that was World War I, the U.S. military needed to replace its bolt-action rifles with a modern semi-automatic weapon that could vastly increase the average infantryman's firepower. During the First World War the U.S. had seen how useful semi-automatic rifles could be, especially the French-made RSC 1917, the first widely issued semi-automatic military rifle. By 1920, Garand was working on rifle designs using a number of different operating mechanisms and locking actions. It wasn't until, though, 1926 that Garand began experimenting with a long-stroke gas piston system that trapped propellant gasses. Testing in 1931 found that the Garand was simple, accurate, and reliable. In other words, a perfect military weapon. But Garand wasn't without some competition. John Pederson, another of America's most talented firearms designers, developed a 7mm cartridge along with a new rifle to fire it. The U.S. Army liked the new .276 cartridge, and for a time, Garand and Pedersen's guns were tested at the same time. In 1932, the U.S. Army decided to abandon Pedersen's .276 cartridge and instead develop a .30-caliber semi-automatic rifle. Garand adapted his design for the new standard, and more testing in 1934 made Garand's new gun the clear favorite. The Army Ordnance Corps' wanted to avoid drilling a port into the rifle's barrel for exporting gas, fearing it would inadvertently shorten the barrel's service life. To avoid this, Garand designed the M1 to use a gas trap system. A small device positioned near the rifle's muzzle captured expanding gases and used the pressure to cycle the rifle's gas piston that ran below the barrel. This long-stroke system's piston attached to an operating rod which rotated the M1's bolt to unlock it and open the action. 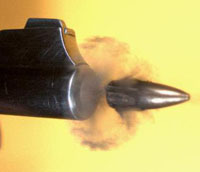 This allowed spent cases to be ejected and a fresh cartridge loaded. But where there's gas there's also carbon build-up, a big problem that sometimes caused malfunctions. And the biggest potential problem was a loose, misaligned gas trap, which, if struck by a round, could blow the entire device off the rifle. This accident-in-waiting was eventually replaced with a gas port that bled gas directly from the barrel to the gas piston, a much safer and more reliable design. Finally, after nearly two decades of development, the U.S. military had their new weapon. Chambered in .30-06, powered by gas, and famous for even the aural sounds of its ejected clip (known more commonly as the "Garand ping"), the M1 Garand rifle was formally adopted on the January 9, 1936. The rifle replaced the bolt-action Springfield M1903, simply called the "'03," in late 1937. Just a few months earlier, a 45-year-old Austrian became the supreme leader of Germany, and the stage would soon be set for the biggest proving ground a weapon has ever faced. When the M1 was first introduced in 1937, a rifleman easily could fire thirty aimed rounds a minute, an unprecedented increase in firepower over the old Springfields. The Garand's rear peep sight also made training to aim the rifle much simpler and was ideal for fast snap shooting at moving targets. The M1 made its European debut during Operation Torch in November 1942. But it first saw action in the Pacific campaign, and it was there that the rifle had to deal with myriad challenging environmental conditions. Subjected to fine sand, mud, salt water, and even volcanic ash, the Garand rarely failed. Its only real downside was sheer bulk. Coming it at about 10 lbs., the M1's balance wasn't perfect and its thick stock made the gun somewhat awkward to carry. Also its en-bloc clip sped up reloads significantly, it made it near impossible to add rounds to a partially full clip. Regardless of its size, troops were loving the new Garand. Staff Sergeant Walt Ehlers, a Medal of Honor recipient who fought in Europe, recalled that "those that trained with the '03 never complained about the M1, because it had so much more firepower...it was just more modern." In April 1945, with an Allied victory in sight, General Patton also expressed his admiration for the M1, calling it "the most deadly rifle in the world." In May the same year, during the Battle of Luzon, private John McKinney won a Medal of Honor for storming a machine gun nest held by ten Japanese troops. McKinney charged the nest with his M1 and killed seven enemy soldiers, emptying his rifle at close range. He then fought off another three in hand-to-hand combat using his Garand as a club. Production of the M1 ended with the conclusion of World War IIâ€”but not for long. With the eruption of the Korean War and the simmering Cold War, production restarted in 1953. Another 340,000 M1s were made by 1956. The fighting in Korea tested the M1 to its limits. The extreme cold of the Korean winters saw many of the U.S. military's small arms freeze upâ€”but not the Garand. Troops reported that of all their weapons, the M1 remained the most reliable. "Those that trained with the '03 never complained about the M1, because it had so much more firepower...it was just more modern." For a brief time the M1 became the rifle of choice across the world, with surplus Garands supplied to South Korea, West Germany, Austria, France, Italy, Japan, Greece, Turkey and South Vietnam. In American service, the M1 soldiered on into the late 1970s, equipping units of the National Guard and U.S. Army Reserve before finally being replaced with M14s and M16s in the 1980s. Garand never accepted royalties for his work and instead gifted the gun's design to his adoptive homeland. Congress tried to grant him a $100,000 reward of gratitude, but nothing ever came of it. Garand continued working at Springfield on other designs until he retired in 1953. He died on February 16, 1974. He was 86. Approximately 5.5 million M1 rifles were made between 1936 and 1956, and then proved themselves in some of the most difficult battles ever fought by the U.S. military. The M1 was finally replaced in 1961, by the select-fire M14, a rifle which owes much of its lineage to John Garand as its receiver, bolt, and sights were nearly identical to the M1. Today, the Civilian Marksmanship Program sells hundreds of thousands of Garands as surplus, while the M1 continues to be a popular civilian rifle for both hunting and target shooting. But the M1 Garand will always be remembered as a weapon that fought a world war and won.